“The Clitheroe Kid” has been spotted on 238 Rich Bryan’s car in recent years, but Jim Aspin was the original. No doubt part of the massive influx of north west drivers brought into the sport by the opening of Nelson Stadium in 1967, Jim first appeared on track in 1968 and went on to race for a further ten years. 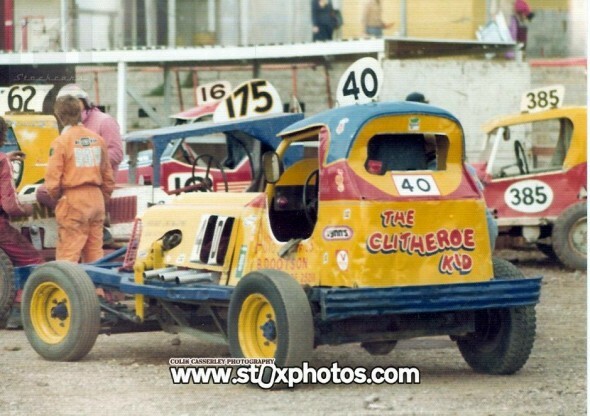 This photo was taken in the pits at Stoke. When Stoke first opened, the pits were where the car park is now, and a staging area where cars lined up for the heat races was around turns 3 & 4.